Saab filed for bankruptcy this past Monday after nearly a year of desperately trying to keep its head above rising financial waters. The automobile company Bob Lutz describes in his most recent book Car Guys Versus Bean Counters as a “lonely, undernourished wallflower” made just one real sports car in its lifetime (the 1966-1974 Type 97 Sonett) and was never a financial or performance powerhouse. Still, it’s a terrible thing whenever any car company dies, and I shed especially sad tears for poor underdog Saab. It was a brand with style and 21st-century potential. The reason Lutz mentions Saab in his book is of course because the company was owned by GM from 1989 until 2010. GM wanted a “premium European” brand in the late 80’s, and Saab was all that was available/affordable at the time. Unfortunately, GM as an organization did not understand what attracted Saab loyalists to their cars–the word most commonly used for that attractive quality is “quirkiness”–and was also unable to enforce cost-saving engineering edicts upon the Swedes. The brand became a self-replenishing red-ink well in GM’s accounting books. Saab’s automobiles became little more than re-badged, restyled Chevrolets where the only unique and possibly “quirky” parts were expensive and invisible to the consumer. Worse, as GM didn’t quite know how to make a Saab that appealed to the loyalists, the product portfolio was never refreshed and became stagnant. The Saab 9-5 that came out and was competitive in 1997 was almost exactly the same when it was finally replaced after the 2009 model year. Who would buy a “new” car with twelve-year-old engineering? 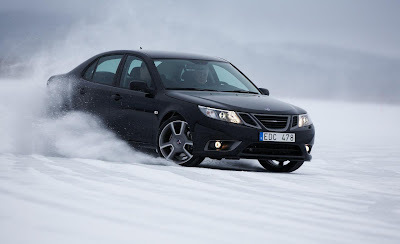 Finally, however, GM cut Saab loose via a slow separation process which began in late 2008. The Swedes were so thrilled to be free of the General that they immediately started hinting about the long-overdue new 9-5. It would share a fair number of components with GM products, but one thing was incredibly new and different: the new car’s design was inspired. Striking. It was clear that someone wanted Saab to be as good as it ever was. The new 9-5 was a fine piece of engineering and design work and as a vehicle, certainly a viable alternative to the equivalent Mercedes/BMWs/Audis, especially if the buyer didn’t want to see a dozen clones of himself before leaving his subdivision in the morning. The thing is, if you’d been paying attention, the new 9-5 was the pièce de résistance. Despite languishing in many ways under inattentive GM, Saab had quietly placed its badge on a small but significant number of good cars in the mid-2000’s. The 2005-2006 9-2X, while despised by Saab loyalists for not being a “real Saab,” was actually a better-looking, better-driving Subaru WRX wagon with the same performance chops and aftermarket tunability. What’s not to love? The next Saab home run came in 2008 when the Swedes sent the United States 600 examples of a flawless black-on-black gem: the 9-3 Turbo X. Pushing 11.6psi of boost through its turbocharger manifold, it made 280 horsepowers, 295 torques, and featured an electronic differential which could throw power to their rear axle, causing Car & Driver to remark that “playful oversteer is easily invoked with simple throttle modulation.” Even better, the Turbo X was available in SportCombi (wagon) form with a six-speed manual. The 9-3 Turbo X. How cool are those wheels?! The problem with all of these cars, especially the 9-5 and the 9-3 Turbo X, was not how they drove or looked, but how high their sticker prices were. Crippled by high operating/production costs and a need to be equipped with premium-segment gizmos and interior materials, they were priced too high and advertised to little to be visible to the mass market, which was busy lusting after the Merc/BMW/Audi trifecta. Saab, in truth, just wasn’t as good as the Germans, nor did it have the brand cachet, but the cars were priced as if it was and did. It was a strategy and situation doomed to failure. The upside of Saab’s bankruptcy is that all of those good, recent cars should suddenly be worth somewhat less on the open market. There are those who fear being without a warranty and/or don’t know that their Saab can easily be serviced at most any GM (or Subaru, if you’ve got a 9-2X) dealership. I would be surprised to see a GM shop turn down service on even a new, post-GM 9-5; again, the platform is Epsilon II–same as the Buick Regal/LaCrosse, among others–and many of the parts bolted to it come from the GM bin. 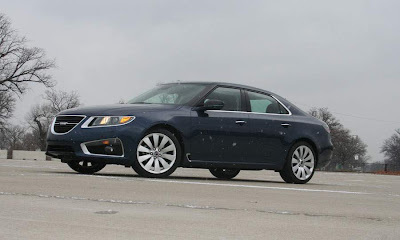 Still, dealers such as True Saab have already re-listed their new inventory for as much as $10k off MSRP. This means that you can get a rare, modern, attractive car for far less than you’d pay for its equivalent, more ubiquitous competitors. As for me personally, I know there aren’t may wagons out there with clutch pedals, let alone wagons with clutch pedals and all-wheel-drive, wrapped up in a package that burdens its underhood horses with less than fourteen pounds each. The 9-3 Turbo X SportCombi XWD is on my family-car list. Previous Previous post: “SENNA” ON NETFLIX INSTANT!